Muni bond funds are very popular for investor in taxable brokerage account. The yield of this bond fund is not subjected to the federal tax rate. This opportunity can provide additional incentive for investor as well as opportunity to diversify their investment asset portfolio. One of this best municipal bond fund is described below. More on best mutual fund, please check my MEPB Financial website. 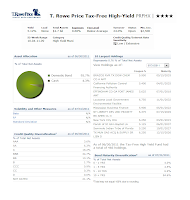 The T. Rowe Price Tax-Free High-Yield fund’s objective is to provide a high level of current income exempt from federal income tax. This TRP fund invests mostly in long-term municipal securities and its weighted average maturity is expected to normally >10 years. This bond fund invests majority portion of its assets in below investment-grade (or junk / high yield) municipal bonds. This T Rowe Price bond fund may buy bonds in default as long as they are <10% of total assets. The fund may also consist <20% of the fund’s income could be derived from securities subject to the alternative minimum tax (or AMT). The fund may invest a significant portion of its assets in sectors with special risks, such as hospitals, electric utility, or private activity bonds. This T Rowe Price fund has an annual expense ratio of 0.68%. This fee is lower than the average expense fee in the High Yield Muni category which is 1.04%. The fund’s manager is James M Murphy since January 2002. The inception date of this fund is March 1, 1985. This fund is a no load fund. It also has no 12b1 fee. The fund has total net assets of $1.73 billion. This Best Muni Bond Fund receives four stars rating from Morningstar. This top rated high yield muni bond fund has returned 4.41% over the past decade, 3.06% over the past 5 years, 4.80% over the past three years and 3.42% over the past year. This best bond fund has its best 1-year total return in 2009 with 31.41%. Its worst performance return was occurred in 2008 with -21.49%. The YTD return is 5.71%. 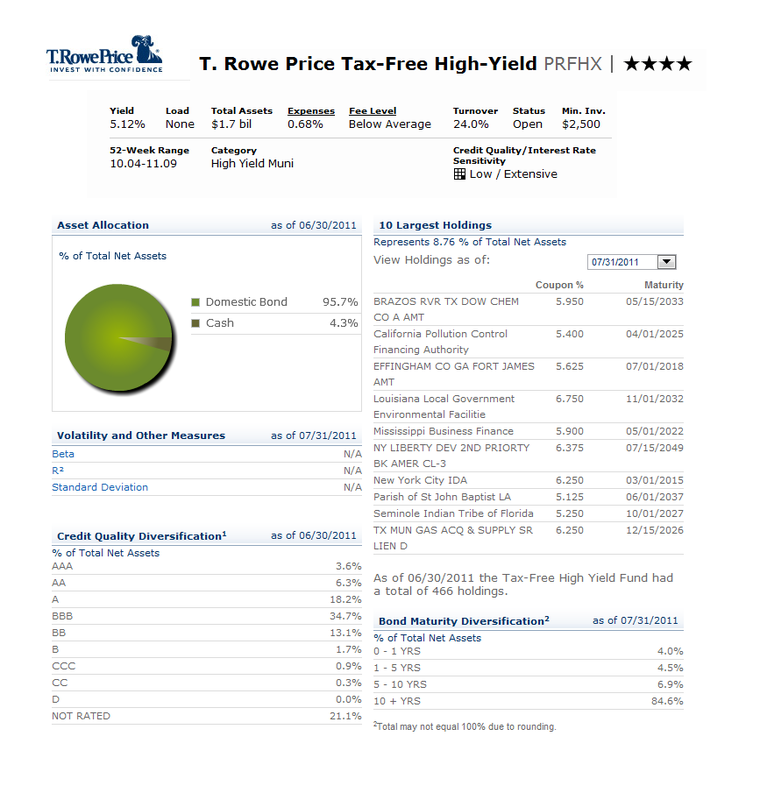 This T. Rowe Price fund uses Lipper High Yield Municipal Debt Funds Average and Barclays Capital 65% HG/35% HY Index as its fund benchmark. For investing in the regular brokerage account of this fund, you will need $2,500 minimum balance and $1,000 for IRA account (tax deferred account or retirement account). This TRP fund is available to many investors. Investors can purchase this fund through 66 brokerages. They are JP Morgan, Vanguard, T Rowe Price, TD Ameritrade Inc, Fidelity Retail Funds Network, Schwab Retail, E Trade Financial, Firstrade, Scottrade TF, etc. There is no other class available for this fund. More details on best brokerages on my website. The top ten holdings of this fund represent 8.76% of the total net assets as of July 2011. They are Brazos RVR TX DOW CHEM CO A AMT (5.950%), California Pollution Control Financing Authority (5.4%), EFFINGHAM CO GA FORT JAMES AMT (5.625%), Louisiana Local Government Environmental Facilities (6.750%), Mississippi Business Finance (5.9%), NY LIBERTY DEV 2ND PRIORTY BK AMER CL-3 (6.375%), New York City IDA (6.250%), Parish of St John Baptist LA (5.125%), Seminole Indian Tribe of Florida (5.250%) and TX MUN GAS ACQ & SUPPLY SR LIEN D (6.250%). These are the top ten out of 466 total holdings. Investing in this bond fund involves principal risks such as Active management risk, Credit risk, Interest rate risk, Municipal securities risk, Liquidity risk, etc.